Purchasing has partnered with a sustainability-focused data research company to help us understand the environmental impact of MSU’s top suppliers. Three studies have been conducted to date, using data from fiscal years 2009, 2012, and 2014. 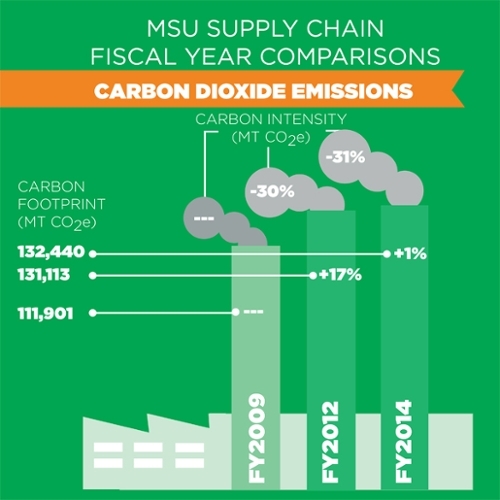 The analysis identifies which companies and industries contribute most to MSU's supply chain carbon footprint. The 2014 study measured 199 top suppliers by expenditure. The supply chain carbon footprint is increasing due to increasing procurement expenditure by MSU. However, the supply chain continues to decrease its carbon intensity, by 30% from FY2009 to FY2012 and by 31% from FY2012 to FY2014. This shrinking intensity is a positive development within the MSU supply chain. 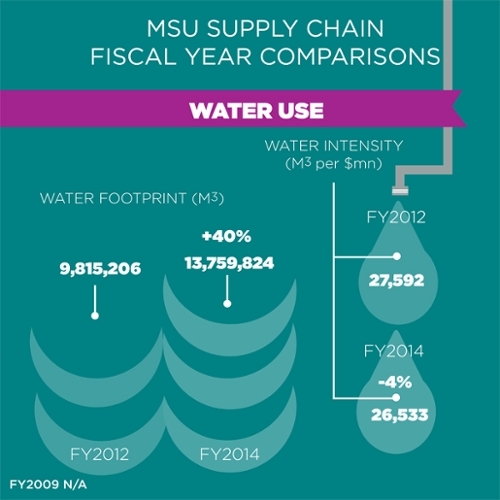 Water use has increased within MSU's supply chain, rising by 40% in total volume since FY2012. As with carbon emissions, water use intensity has decreased 4% on the basis of per million dollars of spend. Sustainability efforts in the supply chain have evolved from its infancy—when activities focused mainly on end-of-product-lifecycle and recycling. At that time, little attention was given to greenhouse gas emissions and other environmental consequences of product manufacturing and transportation to campus. Today, better data—including spend analytics—is available to help University Services make more informed procurement and distribution decisions. Improved supplier engagement and education through workshops and outreach, a commitment to enlist students for sustainability projects, local buying initiatives, and specific goals to reduce greenhouse gas emissions and water use help us measure and evaluate our success in reducing our environmental impact.